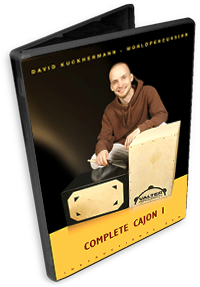 This Cajon DVD teaches playing technique and rhythms from the Flamenco, South-American, Middle-Eastern and modern music traditions. It goes further into applications of ghostnotes, using brushes and adding your feet. All rhythms and techniques are demonstrated in several different tempi, with slow-motion close-up shots. Check out the beginning of the DVD below.